Home Our Garage Door Services Garage Door Openers Why buy an Opener? Thunder crashes overhead! The noise mingles with the heavy drumbeat of rain torrents splashing your car roof and windshield. The windshield wipers fly across the glass at full speed giving you just enough visibility to slowly drive down your street. Towards home. You pull into your driveway, stop the car and – get out and bolt, racing for your manually operated garage door. Within seconds, you are drenched and asking yourself – is this really necessary? The simple answer is no, it is not. With the simple purchase of a garage door opener, you will be able to open your garage door from the war and dry comfort of your driver’s seat. There are a variety of brands and accessories to choose from, as well as different types of opener models with various features. The most common types of openers are chain-drives and belt-drives. Chain-drives are very common but the chain pulling noise can easily be heard within the house whenever the door opens if you have an attached garage. Belt drives are more expensive, but their operation is extremely silent. Sears offers a variety of Craftsman garage door openers with remote control options. Depending on the precise model, they have various security features, a battery backup system in case of power outage, and multiple remotes for multiple users. 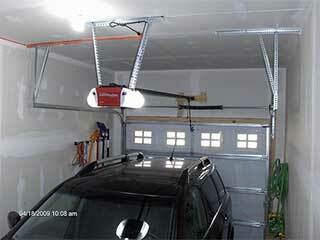 Chamberlain garage door openers are another great option! Like Sears, Chamberlain offers both belt and chain drive openers. They usually include universal remote controls and keypads. A third option is Liftmaster. Liftmaster offers belt, chain and even the less common screw-drive openers, giving a great selection for a variety of needs and budgets. Most opener systems will also come with wireless garage door keypads, for which you'll be able to use your own password, which can be easily changed if necessary. Now that you have made your newest home improvements, let's go back to that stormy day scenario. Lightning flashes across the sky, the wind howls, and the rain is pouring down hard. You turn into the driveway, stop your car and push a button. Your door opens and you drive inside. Dry and warm. Contact our experts at Garage Door Repair San Diego to get the best opener for your door.